Cup pulls are a popular style of cabinet pull because of their ability to be used between different decors. A cup pull can give the look of mid century modern, rustic, contemporary, or many other styles simply depending on the finish, length of the cup pull, and what piece or room you put them in. Many style of hardware don't have this versatility. 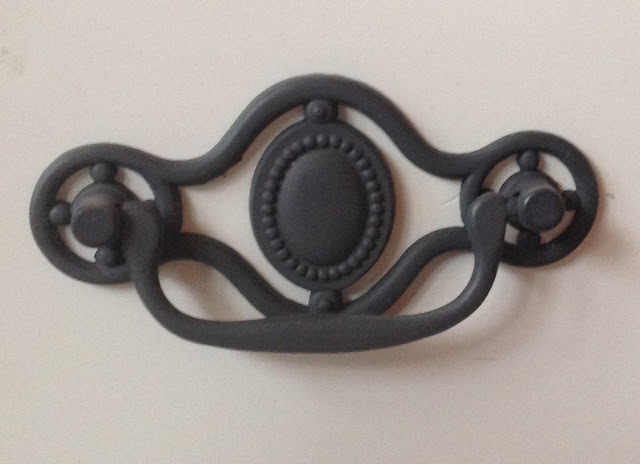 Just imagine putting bar pulls on a rustic farmhouse dresser or in a farmhouse kitchen. It won't look right. But cup pulls have been around long enough that they can be used on pretty well any piece or in any room if you find the right style of cup pull. Over the last several years we've had the pleasure of having D. Lawless cup pulls and cup pulls from other manufacturers that we also sell used on a variety of DIY and home decor blogs. I've taken the time to compile a list of as many as I could remember. I have linked over to the full article on the respective blogs as well as the cup pull used in the article so that you can see more shots of the hardware in use and gather more ideas for your future projects. One of the most popular uses for cup pulls is in "farmhouse" style kitchens. 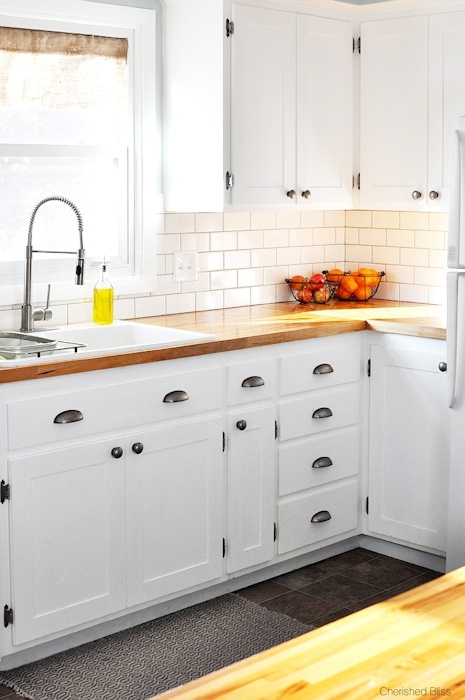 In this white farmhouse kitchen makeover from Cherished Bliss the wide antique pewter cup pulls fit perfectly and contrast very well on the white cabinetry. Next up we have an Ikea Tarva Hack from the DIY blog A House and a Dog. Allison used flat black cup pulls to keep with the primitive look she wanted to keep. 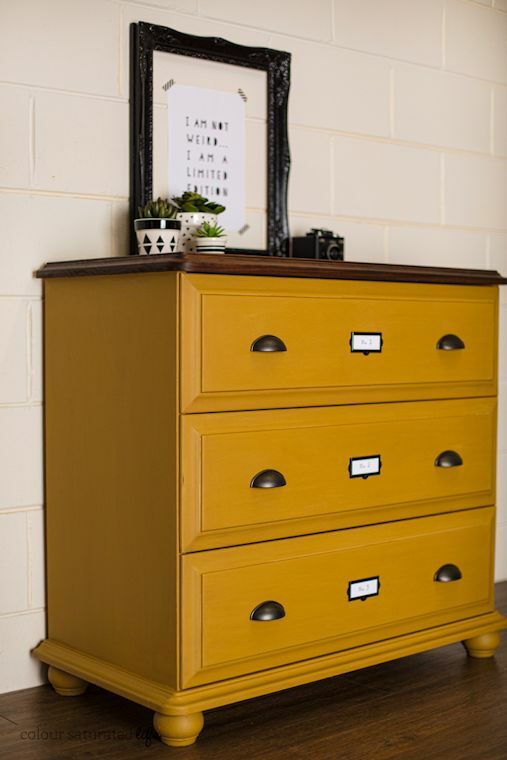 Here we have a unique dresser from Colour Saturated Life out of Australia. 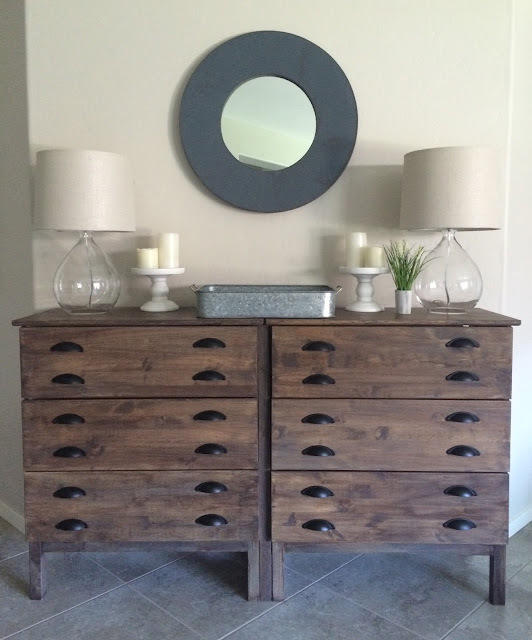 The mustard colored dresser looks gorgeous with the small oil rubbed bronze cup pulls! 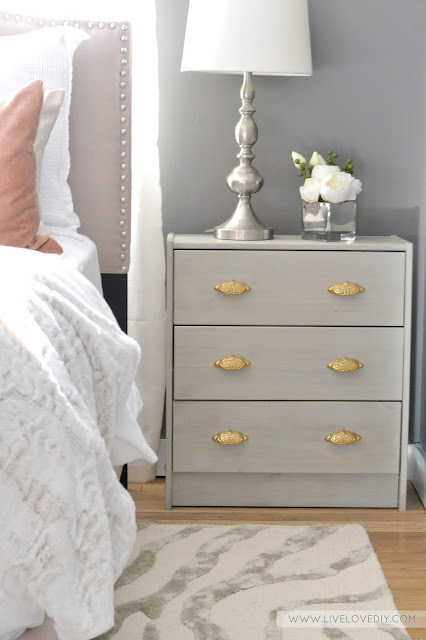 In this dresser makeover Susan from Saw Nail and Paint took your average maple dresser that can be found at any thrift store and turned it into this beautiful piece with Williams Sonoma cup pulls. The brushed satin silver cup pulls work great with the soft tone of the paint. This bathroom from Shayna at The Wood Grain Cottage matches her kitchen right around the corner and illustrates another great way to get contrast in a white kitchen. This time use the same oil rubbed bronze cup pulls as on the mustard dresser above. Oil rubbed bronze has a lot of versatility as a finish as you can see by the vastly different use of this pull in each post. This kitchen from Decor Chick does an awesome job of mixing styles as she matches satin nickel cup pulls with some modern stainless steel bar pulls. Going with satin nickel in cup pulls is a good idea if you have stainless steel hardware. No one carries stainless steel cup pulls and they'll be a close enough match that no one can tell the difference. 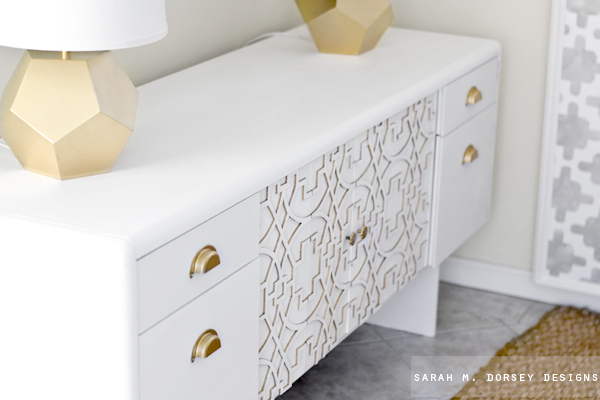 Now we mix it up a bit with this beautiful made over office credenza from Sarah M. Dorsey Designs that uses four brass Hoosier style cup pulls. The full article is worth a look just to see how shabby this thing was to start! This duck egg dresser with antique copper cup pulls from Primitive and Proper is absolutely gorgeous! Antique copper is a great finish to use with distressed or wood stained pieces as it goes so well with natural wood colors. This simple but beautiful sun bleached Ikea hack from Live Love DIY features solid brass Victorian cup pulls. These cup pulls are historic reproduction pieces but they still look great on new furniture. I'll update this article in the future with some of the posts featuring our cup pulls that I'm sure I've missed and also with the new articles coming out in the future.